Thrawsunblat – say that five times fast, or even just once slowly – is a Canadian side-project of Joel Violette of Woods of Ypres fame. He and David Gold (RIP) teamed up to release this slab of northern majesty a few years back and it’s stood the test of time wonderfully. 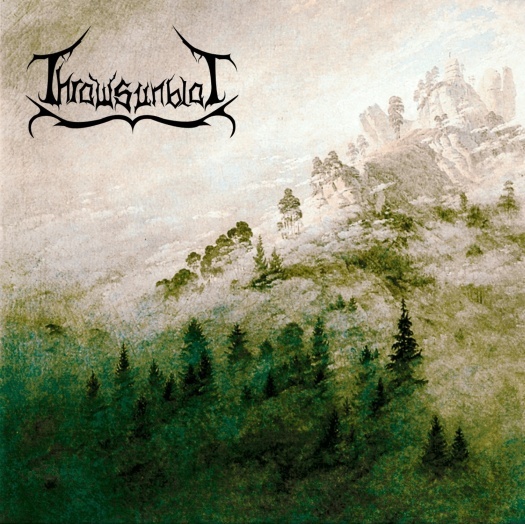 While the comparison to Woods is both obvious and noticeable, Thrawsunblat purvey a much more hopeful sound yet stay in the realm of folkened, melodic black metal. What sets the album apart from the torrent of groups playing a similar genre infusion is Thrawsunblat’s ability to attain folk aesthetics without giving in to clichéd cheesery. There’s no field recordings of babbling brooks, extended acoustic passages where the band sings in forgotten languages or other such attempts to appear falsely one with nature. The folk influences shines through with the carefully constructed riffs and chord progressions, relying on nothing but Joel’s musical prowess. It’s subtle, humble and of the utmost quality, the embodiment of the Canadian ideal. The album is furious and utterly relentless in its attack yet still easily conjures up images of the Great White North without taking you on a dreary tour. David’s frantic blast beats add an undeniable energy to the album, with “Slake the Earth” standing out as Canada 2010’s highlight. The eight tracks blaze by screaming, begging dozens of repeat listens to fully appreciate their graceful nuances and common, snow-lined threads. And fear not, this almost three-year-old project is not laying dormant; Joel is hard at work recording a follow-up.